An entry level rocket that suffers from some quality control problems. At first glance, the lackluster packaging had me thinking "Siesta" instead, but once I delved into the project, there was plenty to like about this single stage 4FNC rocket. The package was the typical plastic "hanging bag" that allowed most of the components to be seen without opening the bag. As a plus (or minus, in this case) the balsa fins were wrapped inside the instructions, along with the decals, for protection. It was apparent that Custom had their sights set on the market that Estes abandoned when the latter went to those ho-hum prebuilt plastic rockets. Custom's offering featured real balsa that required actual construction, which is loads better at teaching kids and/or beginners about proper construction techniques. So far, so good. The plastic nose cone had the most casting flash I have ever seen, but it was easy to remove with an Xacto knife in a few seconds. The first quality control problem was here: the nose cone was way too loose in the body tube, and would fall out every time it was pointed down. This could be easily fixed with masking tape, but that detracts from the overall finished look. The second glitch was the fin stock. These fins were of the poorest quality I have ever seen. They were warped, grainy, and really flimsy, though at least the die-cut fins popped out with ease. No way would this thing fly straight. Custom also took a page from Estes' playbook and included a really short piece of flat elastic shock cord, and utilized Estes' method of mounting with the tri-fold paper and glue. Well, it has worked millions of times, and this is a low power rocket, so why not? And the body tube was slightly crimped on one end, but I had other plans for this end by this point. The rest of the components were excellent. The instructions were among the easiest I have ever seen, though I didn't really use them. I especially liked the painting instructions the best, because this kit was designed for a beginner, and gave a couple of good tips. I decided at first to build this rocket using the same materials and techniques that a kid would use on his or her first rocket, but the warped fins and loose nose cone quickly made me change my mind. While it might fly, it certainly wouldn't fly straight, so some modifications were in order. First of all, I placed the fin stock between a paint can and a large dictionary for a few days, and this flattened them out satisfactorily. I decided against masking tape for the nose cone, and instead mixed balsa sanding dust with 30 minute epoxy, let it set up a while, and slathered it onto the shoulder of the nose cone and into a deep depression at the tip, which was originally covered by the casting flash. I built the motor mount per the instructions, which went together surprisingly well. At least Custom has these parts down pat. Once everything dried, I attached the fins with Elmer's School Gel. This particular adhesive dries quickly, but remains tacky enough to move things around if needed. A decent choice for a beginner. Once the fins were tacked on, I drilled small holes at the root edge through the tube, then used several thin coats of 30 minute epoxy to attach the fins with epoxy rivets and to seal the horribly grainy fins. The result is a bulletproof fin attachment and a much smoother surface. The shock cord was mounted according to the instructions, but I substituted much thinner paper and attached another 100 cm (about 3 feet) of flat elastic shock cord. Prior to painting, however, I decided to repair the crimped body tube by cutting the end of the tube into sections, then folded the flaps down to create a boat tail. I then filled in the gaps with slow drying CA and balsa dust, then again coated the whole thing with epoxy. Once sanded and painted, this added a lot to the looks of the rocket. Once the nose cone was sanded down, the entire rocket was sealed, sanded, and painted gloss white. The nose was painted Calypso Blue that was left over from a model car my son built, and the water based decals were attached. The whole thing was then coated in several thin coats of clear enamel. Other than the miserable fin quality and loose nose cone, the rest was easy to finish. I would prime the whole rocket next time with Krylon gray primer, then apply the white gloss paint, but it still worked out well, and barely any spiral is visible on the body tube. The decals, which didn't look good to me on the packaging, look dynamite on the actual rocket. Once the defects were addressed, this turned out to be a good rocket. But the defects in the original materials made me decide on a 3 1/2 rating. Custom recommends using really low powered 18mm motors for the first flight, but I refuse to purchase 18mm A motors. Why? Well, I built a 13mm to 18mm adaptor in a few second with stuff already in my parts bin. Since 13mm motors are cheaper than 18mm motors, and there are 4 to a pack instead of 3, it makes better economic sense. O.K. so I'm cheap. But if you buy this stuff in bulk, it adds up. Anyway, with an A10-3T on board, the rocket will fly decently high with a slow takeoff. Perfect for a small field. The prep is easy, just add some wadding, stuff in the very long streamer, and attach the nose. Put it on the launcher and fire away. Recovery is excellent on this long streamer. But if you are going to use a C6-7, you'd better have a big field, some assistant trackers, and no wind. This one really gets up there in a hurry! The only con is the weak motor retention clip, which is more like a Quest clip than Estes, in that it has absolutely no springiness to it. But the motors stay in, and I give the flights a solid 5. The extra long plastic streamer is a nice touch. I would definitely add at least double the shock cord that Custom provides. This rocket is durable, and should be around for many launches, IF you keep the power low! I like the fact that somebody is addressing the gap Estes left when they abandoned beginning rocket builders. They now only feature kits that go together with no skill, and kids don't learn anything from that. 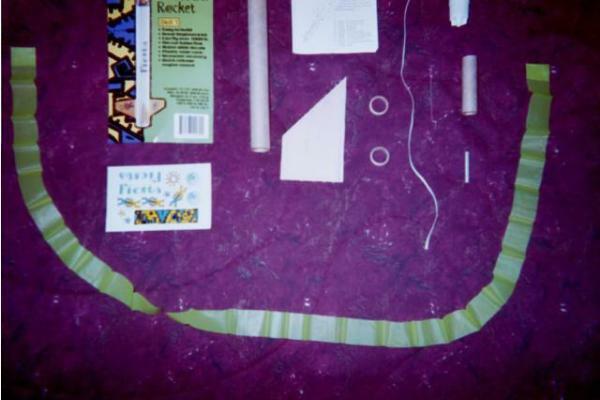 This one required some real rocket construction techniques, and the shabby quality of the fins and nose would ironically help a kid learn how to build a better rocket by overcoming obstacles. I would not recommend this as a first or second kit due to the poor quality pieces I found inside, but it would be great for someone who has built a couple and may be looking for a challenge. Don't let the dull packaging fool you- this is a great rocket. Perhaps Mr. Johnson just fell into a bad kit -- the Fiesta my son recently assembled had nice straight fin stock. I agree that it's a good kit to teach youngsters some basic construction skills, and also that the NC is too loose. But I have seen that problem on many kits with plastic cones (most recently, the Estes Big Daddy). Why these companies can't make the ridges on the cone shoulders a little larger (we can certainly sand or trim them if they're too snug!) is beyond me. Or better yet, include more balsa cones. With the boat tail, the Fiesta reminds this BAR of the old Estes Sprint, which I recall was quite a performer. We'll fly it as soon as the snow melts. Custom does indeed seem to be trying to fill the gap Estes left with its move to more and more one-piece fin assemblies in smaller flyers. I wish them luck and will try at least one more of their kits. An addendum to the above: We flew the Fiesta at the Pittsburgh Space Command's March 2001 sport flying day, and I must say it was an impressive little bugger. Some of the folks there couldn't believe it was only flying on an A8-3. Lost a little paint at the top when the NC apparently kicked back, so I would suggest to anyone building this kit that they use a longer shock cord than the one provided. I bought this kit for my daughter, she put it together with no problems , We didn't even bother to stiffen the fins up. We have flown this many times mostly on C6-7's but also a few time on a D21-4. Without any modifications to the rocket. I concur with the review as written. The NC quality suffers do to poor fit, masking tape was my fix also. The balsa quality on my kit was poor to the point I scrapped them and cut new fins out of stock I had. I have had little issue with broken fins, my glue selection is Ambroid. 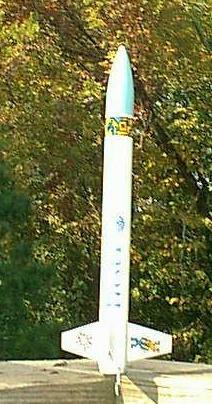 I have flown the rocket in calm and windy days all with good performance. On As and Bs not have had the guts or the field size to attempt a C yet. Life rolls on. My granddaughter became interested in rockets, and I found out there was a club launching rockets nearby on a day I had nothing to do. Emails were exchanged an they graciously invited me to come fly whatever I had. I only had a few Quest A6-4 motors and the local big-box stores have long since quit selling rockets, so I stuffed one in the Fiesta and... embarrassment. It barely cleared the wind sock, about 20 feet up. I don't know if it was a bad motor or what, but this is definitely not the motor to use! Ejection occurred a foot off the ground. No damage. I will say this, the rocket stores well! Clean off the dust and enjoy.